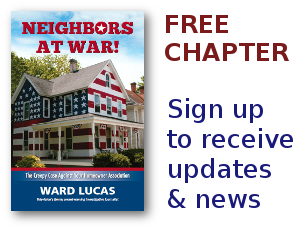 George's Take on the Amateur Radio Parity Act - Neighbors at War! Thanks for your support Ward. Your advice to your readers is on the mark. I know many of the issues that I write on are not easily understood by the average homeowner, but I write to inform those who do understand what I am talking about — the lawyers and supposedly the legislators. My materials are available to help homeowners to get the help that they need to stop the abuse and oppression. I say to your readers/followers to pass on my materials to those who should know what I am discussing. PS. What do you think CAI will say? What can they say?